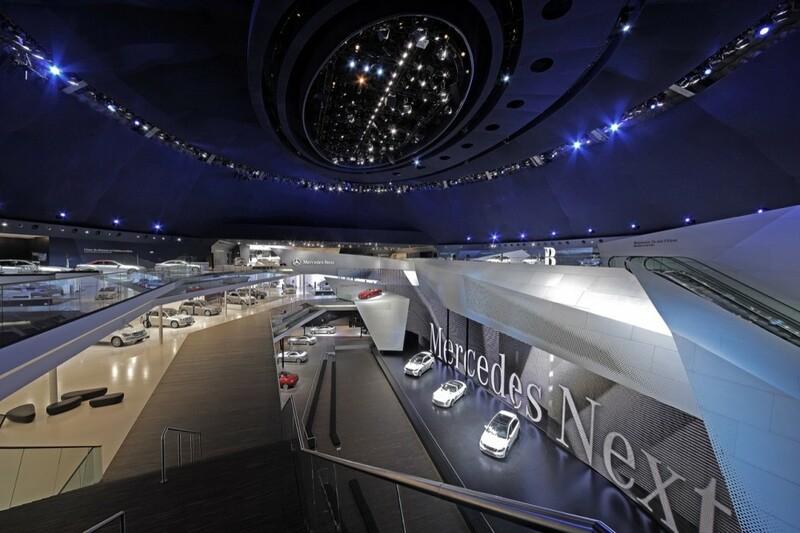 Frankfurt’s Festival Hall once again played host to Mercedes-Benz at the IAA International Motor Show (September 13 – 25, 2011) where the “pulse” of a new generation of automobiles was on display. 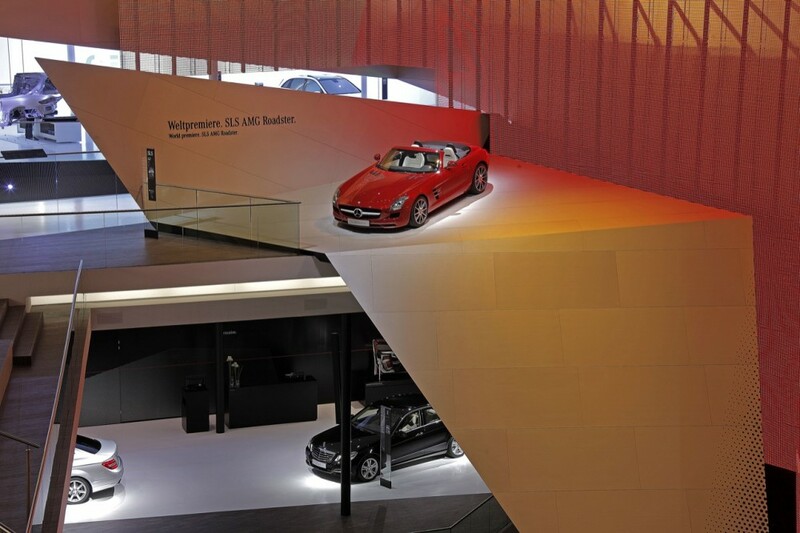 The exhibition design by architectural firm Kauffmann Theilig & Partner and Frankfurt-based Atelier Markgraph was a continuation of this years running-theme: 125 years since the invention of the automobile. This is the 9th consecutive collaboration between the two. 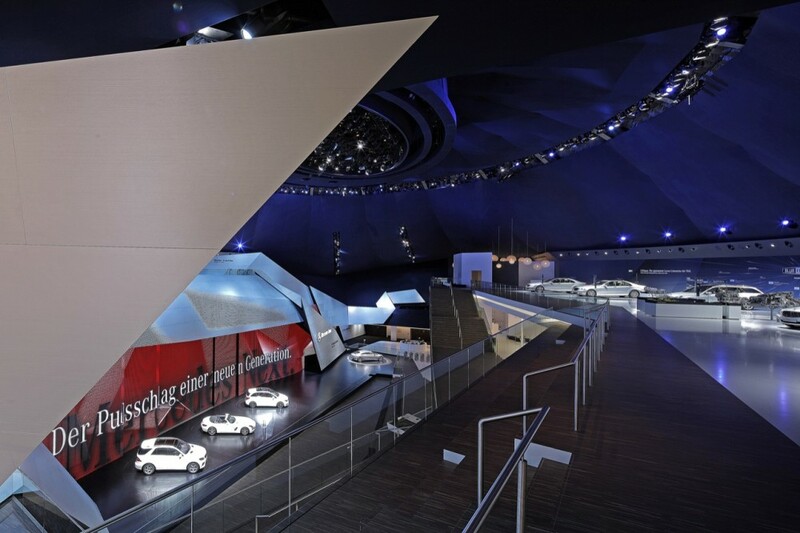 An original image awaits visitors upon entering the historic-domed space, continuing the creative tradition of Mercedes-Benz at the IAA: along the longitudinal axis of the Festival Hall, visitor ranks on the north side and a vast stage on the south side are sharply juxtaposed. Both rise up, reaching towards the suspended midnight-blue dome. 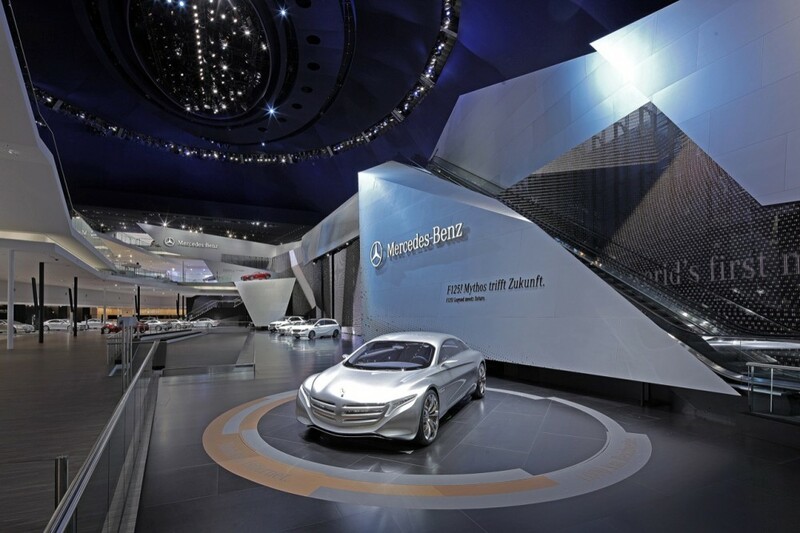 Along the side of the stage spans a 1200 m2, silver anodized and brushed aluminium sculptural band with the Mercedes-Benz trademark. In the center of this sculptural band lies a staggered, kinetic media stage from which a continuous display-cycle of drama arises. 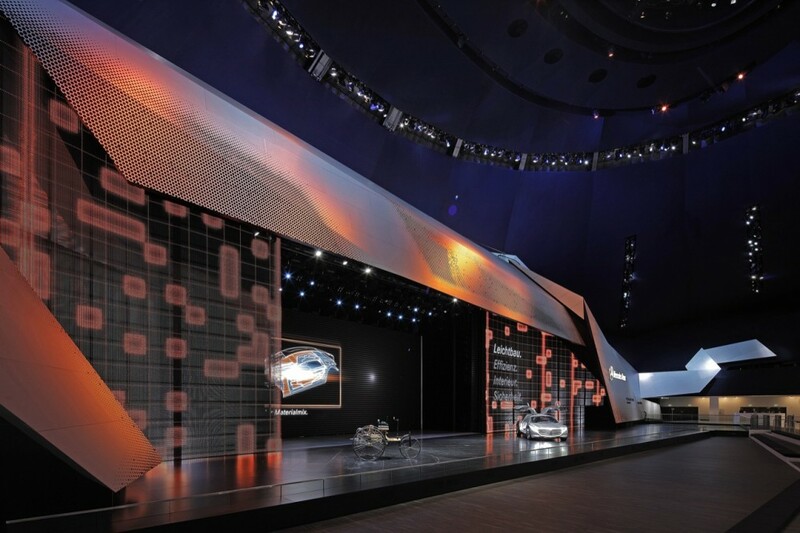 A 40×12 meter, 4 megapixel LED installation bears the central theme of the exhibition space, an animated pulse, giving rhythm to the visitor experience before the unveiling of vehicles. 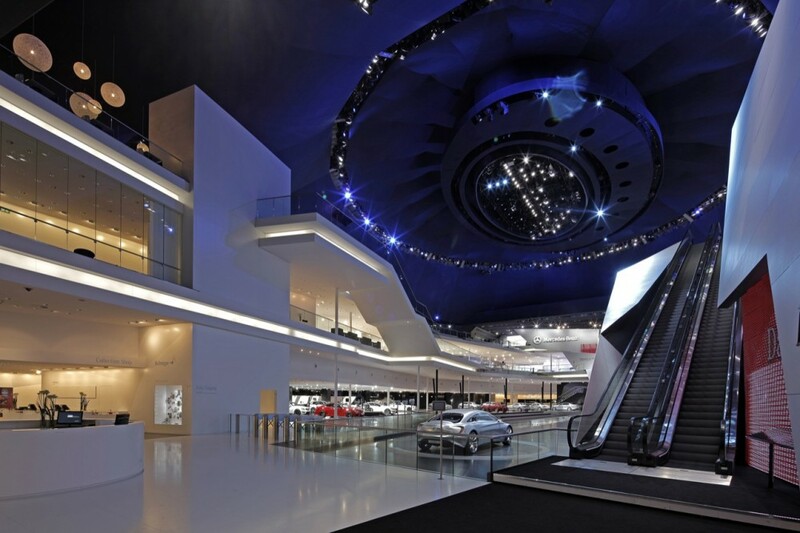 From the entrance of the Festival Hall, visitors steadily rise to a height of 15 meters by escalator, where a breathtaking view over the entire exhibition awaits. From there, a nearly 650 meter route, through intimate, terraced spaces, return visitors to the ground floor. An optimal view of the media stage was intentionally designed through the entire experience. 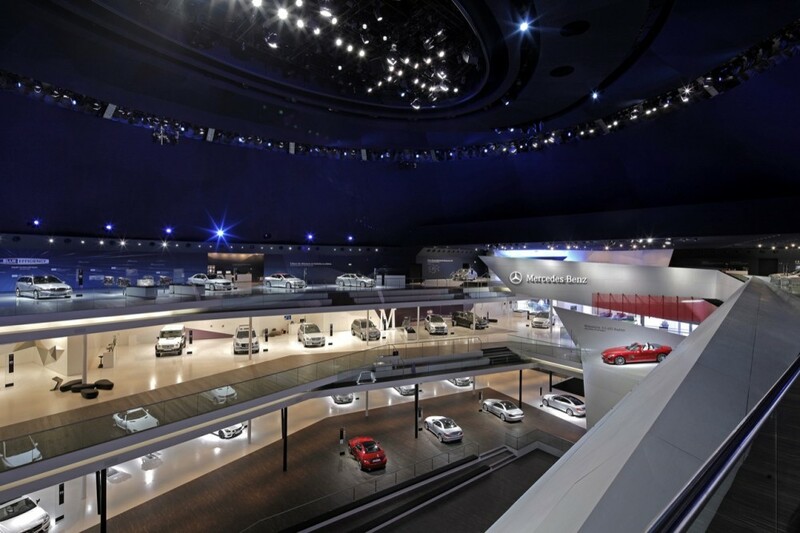 On all exhibition floors, the glass railings, long edges, and built-in seating areas open new vistas and perceptions for visitors, who can leisurely move between the show on one end and information on the other. 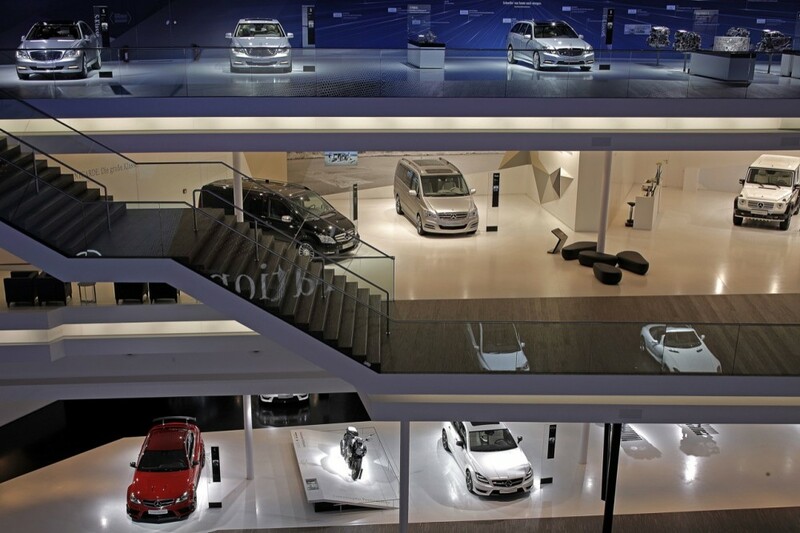 On all three levels, visitors experience well-structured and clearly arranged vehicle areas, historical artefacts and media installations.